In the era of advanced technology, many companies claim to be the best in introducing innovative lawn mowers. But seeing is believing; Craftsman 37619, 18 inch Push Reel Mower is one of the best reel mowers you would really find ideal for small area flat lawns. Research indicates that push reel mowers have seen a steady growth in the market due to the reasons that it is an environment friendly product, makes no noise, easy to use due to its light weight and even some people find it a good alternative tool to exercising thus keeping them healthy. The wider model you choose, the more it makes your job easy in the mowing process. Craftsman 18 inch Push Reel Mower Model # 37619 is used for residential lawns and by far a good example of innovation by Craftsman Company. Customers enjoy using Craftsman innovations and find fun mowing their lawns and customers' reviews reflect the company's reputation which they have rightfully earned over the last few years. The good thing about push reel mowers is that they do not require a start up, gas or petrol which is a costly affair and also these mowers do not pollute the environment. There are also some other kinds of lawn mowers depending on the requirements needed by the customers. They can be riding lawn mowers, lawn tractors, robotic lawn mowers, electronic cord or cordless lawn mowers, rotary and cylinder or reel lawn mowers. Craftsman 37619, 18 inch Push Reel Mower is a form of reel lawn mower and type of walk behind lawn mowers. It is one of those traditional lawn mowers that our fathers or grandfathers used to mow their lawns with and were also heavy at that time. But now, Push Reel mowers are much lighter and stand out prominently among all the types of orthodox lawn mowers. Other than Craftsman 18 inch Push Reel Mower Model # 37619, there are also other models available in the market and also 16 inch Push Reel Mower Model # 37610 is available in the market which is also liked by the users. But according to some users, it has been found that a 16 inch push reel mower takes more time to mow than an 18 inch push reel mower takes. The point behind the review is that wider mowers tend to cut tough and thick grass better. The Craftsman 18 inch Push Reel Mower Model # 37619 will normally cost a person about $120. It has extra wheels at the back which helps the operator and can give a 3 inch high cut also which makes it the best 18 inch push reel mower among other brands in the market. Some of the main features of this product are that it is a form of push mower, which can give a 3 inch cut, with high strength 5 blades, made of heat treated alloy steel, foam made handle, deck cutting width of about 18 inch and comes in Dover gray color with a 2 year warranty. It is easy to use and also easy to adjust with the quick snap height adjusters. The reel is housed in shielded ball bearings. According to some users, Craftsman 18 inch Push Reel Mower Model #37619 was one of the best purchases they made. The users find it highly operator friendly with easy initial setup of the product, easy to push due to its light weight, high environment friendly and also does not require any strings or cord to start and the best of all that it cuts really well. However, this type of the mower is not considered good for cutting tall high grass areas. The issue may resolve in second or third attempt. It's recommended that the blades be sharpened every time before one gets to mowing in order to achieve get better cuts. 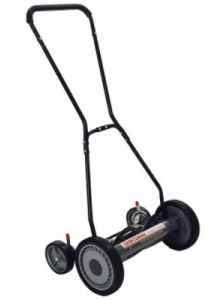 Overall Craftsman 18 inch Push Reel Mower Model # 37619 is go green product, good for small flat lawns, can give good cuts if the high grass is mowed two three times which is not that annoying and a good handy tool for those who are fitness freaks. It does not require much maintenance, is inexpensive and reduces noise and environment pollution.